MASTER PROBLEMS People and Society Why casinos always wins? “Chance”—often we use that word to mean no more than an accidental happening, and it is indeed correctly employed in this manner." But as examples below will show, it has another meaning. It brings to mind the subject of probability. This subject is not just something for mathematics experts, though they particularly relish the intricacies more than others. For one thing, a basic knowledge of how the casinos operate can keep you from naively thinking that you can really win against the casinos in gambling. In the long run you cannot. Why not? 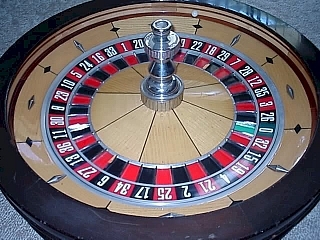 For example, in a casino, there may be a roulette wheel (pictured above) with a series of alternating red and black numerals, 1 through 36; there is also one white zero (0) and a double zero (00). The idea is to bet on one number and, if you win, the casino will give let's say thirty-five times as much as your bet. But probability reveals that this is at a poor risk to the casino. To prove this, imagine yourself placing a one-dollar bet on each of the 38 numerals to guarantee yourself a win. Since only one of them can win, and so for your $38 investment you will get back $36, that is the $35 offered for the win plus your original dollar placed on the winning number. The difference, two dollars, which amounts to over 5 percent is still in the casino’s favor and a loss to you. Now imagine your bet is left to chance, definitely your chances of loss are even higher. True, a customer may hit on a winning streak and win several thousand dollars in one evening. He might do it again for two, three or four evenings. Should the casino be worried? Hardly, the casino knows that in the long run it must win. The laws of probability are still in its favor because of what is called the "law of large numbers." To appreciate the applications of “the law of large numbers", let us consider it at its fundamental level. Flip a coin into the air. Will it land heads or tails? No human can unerringly predict. Flip the coin ten times. How often will it come up heads? Again, no human can foresee. But just suppose that you took time to flip the coin two million times. Then how often will it land heads? About one million. Yes, for reasons that cannot be fully explained by men, the coin, over the long haul, will land half the time heads up. True, in any short test, you do not know for a certainty whether heads or tails will turn up. It may be flipped, seven times out of ten, heads. But next it may turn out to be seven times tails. To further illustrate this lets us use an example we are all familiar with. The law of large numbers also helps insurance companies to set their rates. A customer regularly pays a relatively low sum to a company and it, in turn, pays the customer a certain amount at the time of an emergency. The insurance companies know from experience that they will not have to pay off all clients. How can they be so sure? Life insurance companies, as an example, study the mortality rates of thousands of persons and determine what percentage of persons in each age group die annually. Knowledge of this percentage is the basis for determining the rates that each group pays for its insurance; only a certain percentage, the rates indicate, will have to be paid off in varying amounts through the years. However, when someone wants a special insurance, as when a dancer wants her legs insured, the rates are much higher. Why? Because there are just a few of such cases; the law of large numbers principal is restricted. The risk is greater to the insurance company. Again, it is like flipping a coin. When the insurance company will be, so to speak, flipping the coin thousands of times, the odds are in its favor. But when there is only one flip, the risk is much greater. So the insurance rates are much higher. Do not conclude that holding insurance and gambling are the same; rather, the same laws affect both subjects. In gambling you might win whether you need the money or not. But with insurance you “win” only to cover a loss on your part. So, what are the odds of winning of against the casino? He may know nothing about any law of large numbers, but he earnestly hopes that somehow the right combination happens to appear while he is gambling. But, with thousands of customers playing, in the finally analysis because of " the law of numbers" the casino will always come up top to win against the gamblers. But what if some gambler is lucky to win big money from the casino? Does it mean the casino has lost? On the contrary, this exciting experience of having won will only make him are a constant feature at the casino. He will return with same winnings to casino with the feeling that he is ‘destined to win' again and again, until ultimately finally he loses to the casino. For instance, Charles Wells, an Englishman, visited the Monte Carlo casino in July 1891. In just a few days, he converted ten thousand francs into a million, and astonishingly, he repeated the feat four months later. He acquired an international fame that he had never lost. Many other gamblers tried to discover his “system” but to no avail. Wells always insisted that he never had one. In fact, the next year he lost all his money, and he died penniless." Ironically, the whole episode only turned out to be a publicity coup for the casino. Many people were also wooed to also try their luck at the casino. Thus, increasing the number of customers and with the "law of large numbers' in it's favor, the casino made great gains in the end. You can understand now why casinos stay in business, pay its employees and afford fancy decor. It is because the casinos always wins in the end.